More than 5 million hens will be euthanized at an Iowa egg-laying facility after the majority of them were found to be contaminated with a lethal strain of avian influenza, or bird flu. It is the worst outbreak yet to be recorded in the US. This is the second time a bird flu epidemic has been reported in Iowa, which provides almost 20 percent of all eggs that are consumed in the United States. The facility involved can house up to 5.3 million hens, though there are conflicting accounts about how many birds are currently at the farm. Reuters reports that 3.8 million hens are at the facility and will be culled, while the local Des Moines Register says there are 5.3 million birds to be destroyed. Iowa is home to more than 58 million egg-laying hens, according to the US Department of Agriculture. Officials didn’t identify the facility in question, however Reuters states it is Sunrise Farms, an affiliate of Sonstegard Foods Company. "We went to great lengths to prevent our birds from contracting AI (avian influenza), but despite [our] best efforts we [can] now confirm many of our birds are testing positive," Sonstegard said in a statement to the news outlet. Around 2.6 million hens have already been killed, either by the disease or by officials trying to keep it from spreading further, the Des Moines Register stated. If the problem is not addressed quickly, bird flu is capable of destroying an entire flock in less than 48 hours. The authorities have not pinpointed the source of the bird flu, which is believed to have spread from hen to hen via bird droppings. There is a theory it could have originated from wild birds traveling through the Mississippi flyway, a migratory path that stretches from the Mississippi River up to Canada’s Mackenzie River. The crisis is serious enough that Wisconsin, which has also reported a bird flu outbreak, has declared a state of emergency. "We must act quickly and efficiently to contain the outbreak and protect domestic poultry," Wisconsin Governor Scott Walker (R) said in a statement. "It is important to note, however, there is no threat to humans with the avian flu outbreak." Randy Gordon of the Iowa Poultry Association also reiterated that “the food supply is safe” to the Wall Street Journal. Officials said human infections of bird flu have not been reported. 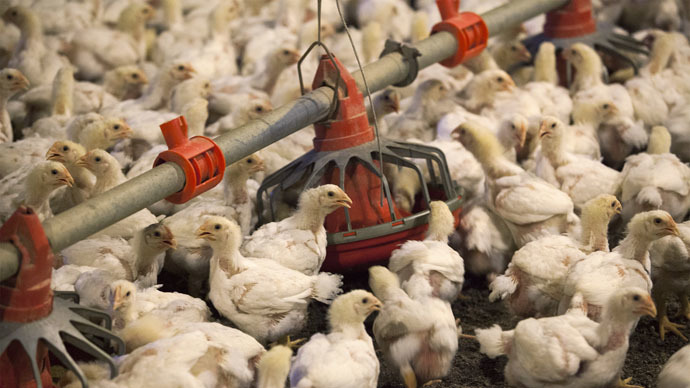 "Anybody that has a poultry operation — whether large or small, whether you've got hundreds of birds or one bird — this should be a wake-up call," Randy Olson, executive director of the Iowa Poultry Association, told the Des Moines Register.